The new fowling piece is an AR-15 I put together just for predators. 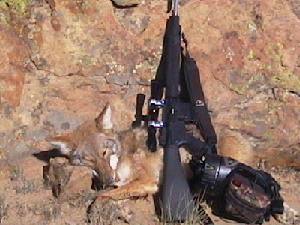 It sports a National Match Trigger, 20" fluted, Stainless barrel, free floated handguard and Leupold 2X7 compact scope. The new caller is a flashlight case, 5" speco 12 watt speaker, Azden wireless microphone, Rio 600 mp3 player and rechargeable batteries. It is light, sounds great and works well for me. 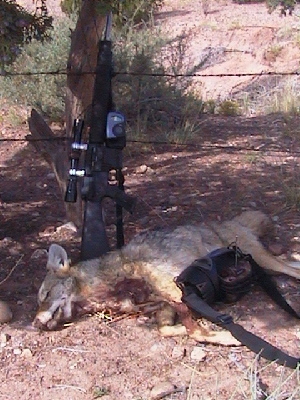 1st coyote to fall to the AR-15. Fourty yard full frontal. (above) Middle picture is a big male I called and shot at noon in 85 degree weather. Picture on far right is another big male who came charging. I wasn't giving any credit that day! The recoil is minimal on the new gun and I've been thinking of the video option. It's so neat to watch Wiley E. roll in the scope that I'm tinkering with mounts for the camera. If it works I'll build a page with the details. 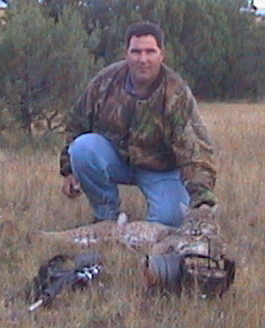 **Update**- The bobcat goal has been met. Bird distress one afternoon in October put this in my lap. Life is great, now where's that fox? I do love this so. The crisp fall weather is upon us and the dogs are coming. 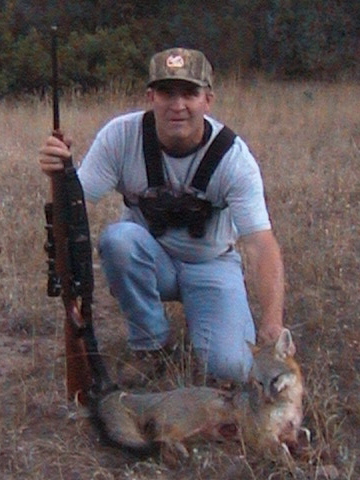 My goal is to whack a fox and bobcat this winter. I've created some custom call sounds for that purpose and will let you know how they are working. The fox came as well. This is Kevin Lee who was in position when they came, all three of them. 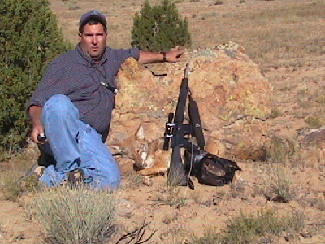 We set up at the edge of some really thick cover littered with bear and fox droppings. A fox distress call brought one through the thick stuff pronto. 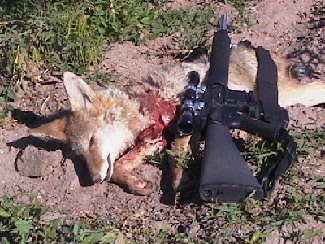 Two shots at him were errant but we kept calling and moments later two more foxes came down. They were dressed for business, hackles up and chattering some fox trash talk. This one was about to jump on the caller when he was dispatched. So, my goal for 2003 is met and 2004 is only weeks away.